As EU countries and the United States fortify their borders against refugees and illegal immigrants, Keren Weitzberg explores in her new book, We do not have borders: Greater Somalia and the predicaments of belonging in Kenya, how borders in the ‘Global South’ operate and how the future of migration is African. From the scandal over the fate of the Windrush generation in the UK to the forced separation of migrant families along the US/Mexico frontier, we are witnessing an escalation of violence as wealthy nation-states try to ‘settle’ the question of indigeneity. Whether through hostile immigration policies or fortified security walls, governments throughout the Western world are using violence to reinforce North-South boundaries. As many Western countries try to externalize the refugee and immigration ‘problem’ by striking deals with transit countries such as Mexico, Libya, and Turkey, it is worth considering how borders in the ‘Global South’ operate and how they are beginning to change. The highly securitized frontiers that have increasingly become the norm in wealthier countries (like the US, Israel, and Saudi Arabia) since 9/11 stand in sharp contrast to the highly porous borders that exist in much of the rest of the world. In fact, the world’s top refugee host countries are located almost exclusively in Africa and the Middle East, in countries where borders are far less heavily policed. 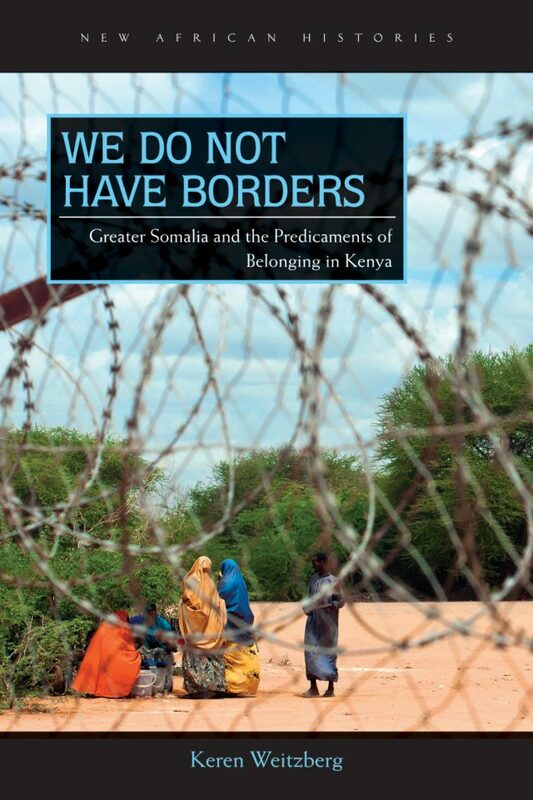 We Do Not Have Borders: Greater Somalia and the Predicaments of Belonging in Kenya (Ohio University Press, 2017) looks at one such region in the ‘Global South’. We Do Not Have Borders examines the history of a people who have both crossed and been crossed by borders. It raises the question: Why are Somalis, who have lived within Kenya for generations, widely perceived to not fully ‘belong’ to the nation? There are a number of broader lessons from this book that can help inform contemporary debates over migration. Before refugees from Somalia began to flee into neighboring countries in the late 1980s, Kenya was already home to a sizeable Somali population. Somali transnational networks long predate the nation-state. In fact, many Somalis can trace their roots to people who were living in what is today Kenya before territorial boundaries were drawn in the late nineteenth century. Nevertheless, decades before the Somali refugee crisis, Somalis were already widely perceived to be ‘foreigners’ in the country. As the case of Kenyan Somalis shows, one does not need to be a recent migrant (or a migrant at all) to be deemed a ‘foreigner.’ One’s ‘foreignness’ has less to do with migratory histories than it does one’s relationship to class, cultural, ethnic, and racial hierarchies. Moreover, as Sara Ahmed suggests, foreigners are ‘familiar.’ They are threatening precisely because they represent suppressed, alternative histories of the nation-state. Barring African and Arab migrants entry to European countries, for example, effaces the long history of colonization that helped to constitute Europe as well as the centuries of Muslim and African presence on the continent. To many Kenyans, Somalis embody the vision of ‘Greater Somalia,’ an alternative pan-nationalist project that was brutally repressed by the Kenyan state in the 1960s. Thus, solving the refugee ‘crisis’ (whose scale, in many cases, is widely exaggerated) is not simply a matter of forging better immigration policies. It also requires citizens to grapple honestly with the exclusionary politics that have given birth to dominant nationalist projects. Mobility has long been a feature of life in East Africa. Under British rule, protectorate and colonial administrators generally sought to restrict the movement of African subjects, but had limited capacity to effectively enforce borders. British officials came to think of Somali nomads and urbanites as a people ‘out of place’ within the colony of Kenya, who could not be confined to native reserves and who blurred the boundary between ‘native’ and ‘non-native.’ Nevertheless, imperial structures were, by definition, supraterritorial. Many immigrant communities were able to form horizontal solidarities that stretched across colonial boundaries and to imagine themselves, as Thomas Metcalf notes, ‘not merely as colonial subjects but as imperial citizens.’ Moreover, nomads regularly crossed imperial frontiers and continued to see pastoralism as a viable strategy throughout much of British rule. The nomadic pastoral networks, seafaring diasporas, and global commercial and religious circuits to which Somalis in Kenya have been a part have troubled the Kenyan nation-state since independence. And yet Somalis have also managed to carve out important political, social, and economic niches in the country, especially in recent years. In addition, Kenya has become one of the top host countries for refugees. This is largely because the country’s international boundaries have remained comparatively open and the UNHCR has sought to ‘contain’ the East African refugee crisis in the region. While Kenyan officials have, at various moments, cracked down on Somalis living in Nairobi and threatened to close down refugee camps, which have become permanent fixtures in the north, this status quo remains relatively unchallenged. While there was never a time of unhindered mobility, large-scale and highly securitized national borders are largely recent features of the late capitalist era. Despite the growth of fortified enclaves within urban areas, wildlife preserves, and commercial spaces on the continent, African international boundaries have remained highly porous. Thus, it is worth seeing the Kenya/Somali frontier less as a ‘security problem’ than as a convergence with a historical norm. Policy makers are increasingly recognizing the limitations of the refugee encampment model. Migrants and asylum seekers are not divorced from social and political bonds and are, in fact, drawing upon and reinventing older forms of social and economic life. The Kakuma and Dadaab refugee camps in northern Kenya, intended to be temporary, have come to resemble permanent urban areas that are deeply incorporated into wider regional social and economic networks. Meanwhile, many asylum seekers from Somalia, Ethiopia, Sudan, and elsewhere have woven themselves into the social fabric of Nairobi and other towns and cities, often by circumventing formal immigration and refugee controls. The case of Kenya (and other African refugee host nations, like Uganda) shows just how important preexisting, ‘informal’ cross-border networks are to refugee survival. Somali asylum seekers have relied heavily on bonds with kin across the border in order to gain refuge and establish lives for themselves in Kenya. Many of the transnational networks that emerged in the wake of the Somali civil war can be understood as contemporary permutations of forms of organization that have much deeper roots in the region. Though the process has not been seamless, nationalist projects have also grown and evolved as a result of these migratory flows. As We Do Not Have Borders shows, the Somali civil war and the attendant refugee crisis has led to a profound reconfiguration of the idea of a ‘Greater Somalia’ and a renewed interest among Somalis in achieving minority rights within Kenya. In a recent piece in the Washington Post, Salih Booker and Ari Rickman argue that ‘the future is African.’ By the end of the century, they note, about 40 percent of the world’s population will be African. In light of this demographic trend, Africa is likely to be the world’s largest source of emigrants. This may be true, but the continent is also likely to remain a major destination for migrants and refugees. The US, Europe, Israel, and a number of Gulf states are increasingly abdicating responsibility for displaced people in spite of the links between warfare, climate change, and the policies of wealthy nations. International humanitarian operations like the UNHCR, though they may help to alleviate human suffering, also tend to merge ‘seamlessly into existing structures of political and economic oppression, reinforcing instead of challenging them’. Countries like Kenya, Uganda, and Tanzania are, in many ways, at the forefront of global migration policy. But that future should not be borne by African nations simply because wealthier countries and international organizations have chosen to build a fortress of the Global North. Keren Weitzberg is a historian of East Africa based at the Institute of Advanced Studies at University College London. Previous articleTwo narratives are being spun about Zimbabwe’s poll. Which one will win the day? Next articleSouthern Africa’s liberation movements: Can they abandon old bad habits?